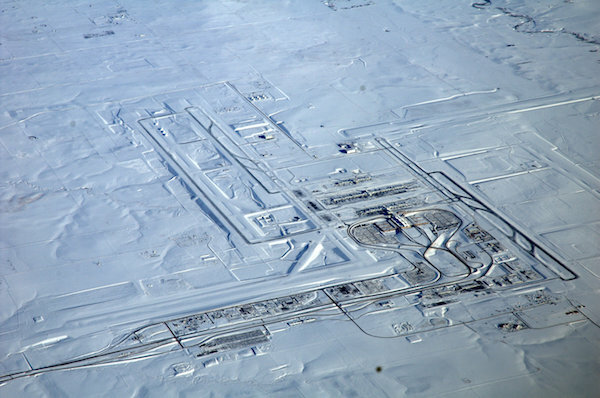 Denver International Airport under a blanket of snow. Working the holidays can be interesting for police officers and other first responders. New Year‘s Eve and the Fourth of July are usually busy for cops, but many of the other holidays are quiet. Holidays can be emotional times for everyone. When the holiday season becomes too difficult for some people, they may reach out for help or commit crimes, and it’s frequently police officers who deal with them. Many cops have stories of working holidays that made it memorable for them. I thought I’d share one I experienced from a Christmas past. In 1982 the Denver area was struck by a blizzard on Christmas day. A Denver Post article (dated December 18, 2012) stated that according to an official tally from the National Oceanic and Atmospheric Administration (NOAA), it was reported the Denver metro area received 23.8 inches of snow within a 30 hour period; however, with drifts and the wind it was piled much higher in spots. Hospitals asked for public assistance from people with four-wheel-drive vehicles to get patients to emergency rooms. The airport was closed, travelers were stranded. Grocery stores reported being out of food. The paper also reported that several people died during this massive storm. At the time I was working for the Westminster, Colo., Police Department. When the storm started on Christmas Eve, all of the officers on duty were instructed to report to the police station because the streets were getting too treacherous. We were no longer able to have any police cars on the road. In fact, the few of us able to get to work had to spend the night at the police station. The rest of the department’s personnel were snowed in at their homes, unable to get to work. Throughout that night the police department continually received calls from people stuck in the snow or needing assistance. Unfortunately, as the storm intensified, we had no way to reach them. In the early morning hours of Christmas day, police dispatch received a call of a possible dead body in a local subdivision. The entire metro-area was snowed in, but we had to find a way to reach the residence. Two fellow officers and I volunteered to go investigate the call. At the time the department had no four-wheel-drive vehicles so our only hope in answering the call was to take one of the officer’s personal truck. The snow was several feet deep and it took us almost an hour to drive the 22 blocks to the area where the home was located. Due to the depth of the snow, we were only able to drive to within six blocks. We then had to wade through chest–deep snow. After about 45 minutes of struggling we were finally able to reach the house. Once in the home we discovered a woman had apparently overdosed on pills, possibly a suicide. There were three other people in the home (one of them her boyfriend), but no family members. Due to the weather, no detectives or crime scene personnel were able to respond. It was up to the three of us to separate and interview witnesses, and investigate the scene. Dispatch then advised us that neither an ambulance nor the coroner were able to get through the snow to transport the woman’s body. After several phone calls the coroner finally advised that he could use his personal four-wheel-drive vehicle to try to get close to us. After waiting several anxious hours in the home (with the dead women and her friends), the coroner called us and said he couldn’t get into the subdivision. The snow was just too deep. Our only option was to remove the victim from the dwelling and try to get her to the coroner‘s location. The residents in the home gave us a metallic space blanket to wrap the body in. This blanket seemed the perfect way to transport her: it would allow us to slide her across the snow. The coroner was parked about five blocks away so the three of us had to trek through chest-deep snow in some areas, and slide her body along the top of the snow drifts. As you can imagine, it was a difficult task and took us well over an hour to reach the Coroner’s vehicle. As we dragged her through the snow, it was a challenge to keep the body wrapped. The top of the woman’s head became exposed and her long brown hair was visible as it flowed across the snow, while her feet at times were sticking out of the bottom of the blanket. I vividly remember looking at her feet and noticing that each one of her toenails was painted a different color. While struggling through the neighborhood streets, we observed numerous residents watching us from their homes. It was obvious what we were doing and that we were struggling. Once we finally reached the coroner’s vehicle, we discovered he was driving a small, two-door Ford Bronco 2—with no room to hold a frozen body. We couldn’t maneuver her limbs and torso to fit through the doors of his car so our only solution was to open the rear hatch and place her in the small storage space behind the rear seat. The coroner placed his jacket over her to hide her as he drove away. We then had to trudge through the deep snow to reach our vehicle and make it back to the station. I never heard why she took her life or anything else about her case. As is common in police work, we moved on to the next call or the next case. Eventually the snow melted and the city got back to normal. Captain Joseph Padilla (ret.) has commanded the Gang, Juvenile and Traffic Operations and Civil Liability/Professional Standards Bureaus of the Denver Police Department. He has managed several large events including the traffic and transportation plan for the Democratic National Convention, the World Series, Presidential visits, large protests, parades and other high profile activities. He previously served as the manager of the Investigative Support Center for the Rocky Mountain H.I.D.T.A. (High Intensity Drug Trafficking Area) program. During his thirty-plus year career Joe has survived several critical incidents, including being involved in fatal police shootings. He has received his department's Medal of Honor (including being nominated for the Presidential Medal of Valor), three Medals of Valor, two Distinguished Service Crosses and numerous other commendations. He is a graduate of the 235th session of the FBI National Academy and retired from law enforcement in 2015.